Most buyers start their real estate searches online, so outstanding internet exposure is a must when it comes to selling your home. When you list your property with Barrett SIR, you are instantly connected with a fast growing internet network of affiliations and distribution channels, in an effort to target buyers online. Our properties are distributed to potential buyers and buyer’s brokers, syndicated to barrettsothebysrealty.com immediately and Sothebysrealty.com - gaining true international exposure by being available on all of these sites prospective buyers frequent during their search. Even our competitors will tell you, no listings in our market area get more exposure to buyers than those listed with Barrett Sotheby’s International Realty. Our listings get steady exposure to the many buyers looking for homes in our area. Our award winning print advertising is only a small portion of our marketing efforts aimed at driving traffic to our website and your front door! We use online display ads to drive traffic to our site where your home is showcased. We employ paid search ads, retargeted to follow real estate intenders, social media infographics, and have a healthy YouTube channel of property videos; all to attract and inform your buyer through the life-cycle of their search. We have the experience, the knowledge and the discretion to represent your property and your interests in the journey to sell your property. Our savvy, dedicated and professional support staff provide our agents with extraordinary tools to market your property expertly and efficiently in local and international markets. Our offices are situated in desirable communities, staffed with the best local experts in the business, whose market expertise provides Greater Boston coverage. Your agent will review with you our methodical approach to selling real estate. Email distribution to brokers, suggestions for property improvements to present your home for success, our showing policies (that respect you and your family), and how negotiations will be conducted. Even though the Sotheby's International Realty brand is recognized as an aspirational brand serving the luxury market, it's important to highlight that luxury is an experience, not a price point. We represent extraordinary homes in a variety of lifestyle categories and price ranges. 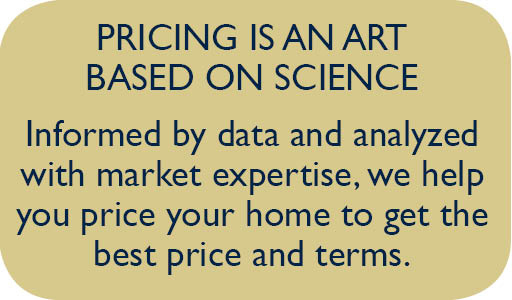 Our agents’ deep knowledge of your community allows them to develop an accurate Opinion of Value based on statistical data. You can be confident that your home will have the ideal price for you, and buyers, when your listing hits the market. Contact us to schedule a viewing or with any questions.